Over having to rock your baby for 30-60 minutes straight? Over trying to awkwardly maneuver him out of your arms and lower him down oh-so-gently into the crib? Over matrixing your way out of the room to avoid the squeaks in the floors? Over having to close the door slowly so it doesn’t make a noise when it hits the frame? Over collapsing onto the couch and praying to god that he doesn’t wake up? Are you just over ALL OF IT?! Sleep deprivation is no joke! It takes a toll on the entire family. Don’t wait until it’s too late! Grab your FREE Exhausted Mom’s Survival Kit HERE. You’ll learn strategies you can implement immediately to get your kids sleeping well at night :). Not only does it take a lot of time doing that 3-4 times throughout the day for naps and then again for bedtime; but it also becomes painful! As your baby gets bigger, it becomes more difficult to rock him for that long. The process is simply exhausting. If you’re ready to make a change, read on. WHAT IS SLEEP TRAINING AND WHEN CAN I START? Sleep training is the process of helping your baby learn to fall asleep on their own and staying asleep through the night. There are a few different approaches to sleep training but this guide focuses on just one- Controlled Crying. The Controlled Crying approach is when you go in at intervals to check on your baby. You set a time limit on how long your baby cries. This could be anywhere from 2 minutes to 10 minutes- whatever you’re comfortable with. Controlled Crying is NOT leaving your baby in their room to cry indefinitely. An approach like that is not advised nor will be discussed on Mommy Messenger. Sleep training can begin when your child is between 4 and 6 months old. This is typically the age when babies develop a regular sleep-wake cycle and drop most of their night feedings. Prior to sleep training, it is important to rule out any medical conditions that could affect your baby’s sleep. Things you can do from day 1 to set your baby up for quality sleep that will help tremendously with future sleep training. Getting your baby used to a predictable daily routine will pay off big time down the road. A daily rhythm will help their brains and bodies anticipate the next step whether that be eating, playing, or sleeping. Humans thrive on predictability and babies are no different. The Eat-Play-Sleep routine is a flexible (not by the clock) way to structure your baby’s day and provide that needed predictability. A huge advantage to following this routine from the very beginning is that the sequence ensures that Eating is separate from Sleeping. Getting in the habit of feeding right before sleep (or feeding TO sleep) tells your baby’s brain that the only way to fall asleep is by eating. They start to link those 2 things as cause and effect. While it may “work” now, it may be very challenging to change as your child gets older. You may soon have a child who requires a bottle or nursing multiple times per night just as comfort because it’s the only way they know how to fall asleep. The Eat-Play-Sleep routine is only effective if you have a good understanding of how long the awake time (Eat + Play time) should last based on your child’s age. For example, a 1-month-old should NOT be awake for 3 hours at a time in between naps! This will most definitely make for a very overtired baby which will fight the nap. Read more about awake time AND access a free chart here! Most daycares are good about implementing a schedule that makes sure kids are going down for naps at the right times for their age, but if your child is with a babysitter, grandparent, in-home provider, or someone else, it is a good idea to have your routine written down for them. A good sleep routine will prepare baby for sleep and signal to their brain that it’s now time to rest. A sleep routine doesn’t have to be long; it just has to be consistent. Pick a few slow-paced, calming activities that you think your baby will love and make sure to do the sequence before all naps and bedtime every single day. It doesn’t particularly matter WHAT steps you choose for the routine (obviously not anything high energy) as long as you do them consistently. Don’t add things to the routine that you know you won’t be able to follow through with for every sleep. Typically people like to add a few things prior to the core sleep routine (listed above) for the bedtime routine such as bath, books, massage, or lullabies. Just like the daily routine, it’s important that all your child’s caregivers are carrying out the same routine for consistency. Participating in the same routine regardless of setting will bring your child great comfort and security so it’s a win-win for both parties! 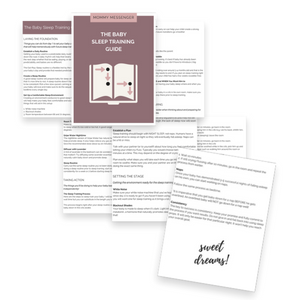 Grab your free sleep training guide! Success! Now check your email (Inbox AND Promotions) to get your free download! Room temperature between 68 and 72 degrees. Pick items that are free of ribbons, buttons, and small plastic parts. Stuffed toys should be filled with cotton or acrylic batting, not beans or plastic beads. When preparing for sleep training, it’s best if baby has already been transitioned out of the swaddle so you don’t have to introduce 2 big changes at the same time. Typically babies will start rolling over around 3-4 months old and that is the primary sign that swaddling needs to end. If you plan on sleep training right at 4 months old, make sure your child has had a few weeks swaddle-free. Baby Merlin’s Magic Sleepsuit is a great way to transition out of the swaddle. It gets your baby used to having his arms free but the padding muffles the reflexes so they don’t wake him up! Focus your initial efforts on having your baby sleep where and when you want him to sleep. If you ultimately want your baby in a crib in his own room, make sure you work on getting him to sleep there prior to sleep training. You also want to make sure he is successful with the daily Eat-Play-Sleep routine up until sleep training. If you need to rock him to sleep in order to keep him on your Eat-Play-Sleep routine (following the recommended awake times) then do that. Don’t beat yourself up about using sleep props (i.e. rocking, nursing, etc) those first 4 months. Just get your baby sleeping WHEN he is supposed to. Things you need to consider when thinking about and preparing for the sleep training process. Sleep training should begin with NIGHT SLEEP, not naps. Humans have a natural drive to sleep at night so they will eventually fall asleep. Naps can be a hit or miss. Talk with your partner (or to yourself!) about how long you feel comfortable letting your child cry/fuss. Typically you would choose between 5 and 10 minutes at a time. This may depend on the degree of crying. Plan exactly what steps you will take each time you go into your baby’s room to soothe. Make sure you and your partner are on the same page and doing the exact same thing. It will be beneficial for both of you to hang out together so you can support each other and take turns going in the room to soothe. If you are not able to do this with someone, don’t worry, it can be done alone! Getting the environment ready for the sleep training process. Make sure your white noise machine (that you’ve hopefully been utilizing since day 1) is ready to go! If you haven’t been using a white noise machine, you will want one for sleep training as it brings a lot of comfort to babies. It is important to get a good one like this one. Some sound like radio static while others sound like a soothing fan. The one I recommend is specifically made with a built-in fan so it sounds like rushing air. Blackout shades are a lifesaver. Especially during the time of year when it doesn’t get dark until after bedtime! It’s difficult for babies (or anyone for that matter) to fall asleep when the sun is shining into your room! It is also extremely beneficial for naps for that same reason. Your body is made to sleep when it’s dark. Light inhibits the secretion of melatonin, a hormone that naturally promotes sleep. You don’t want to do that! Don’t worry about spending a fortune on fancy blackout shades/curtains. Go for the cheap temporary paper shades that get the job done just as well! Make sure your baby’s room is at a comfortable temperature. It’s not easy to sleep when it’s too cold or too hot. A good range is between 68 and 72 degrees. The nighttime version of Gripe Water has natural herbal ingredients that help promote sleep. It also helps relieve any gas and stomach discomfort. Give the recommended dose about 15-20 minutes prior to bedtime. My husband and I swear by this stuff! No one sleeps well when they have an upset, gassy tummy. Gripe Water made sure that wasn’t an issue for our son. A hint of lavender in the bedroom can do wonders for a baby (or anyone for that matter!). Try diffusing some lavender essential oil in the room to naturally calm baby down and promote sleep. Carry out the same sleep routine you’ve been doing. If you haven’t been doing a sleep routine prior to sleep training, start one now and stick with it consistently for a week or 2 before starting sleep training. The things you’ll be doing to help your baby learn to fall asleep independently! We have finally arrived at the part you’ve been waiting for! Let’s jump right in. Here are the steps to sleep train your baby. I will be using 10 minutes as the wait time but you can substitute in the length you’ve chosen. This process begins right after your sleep routine so you’ve just laid your baby down in the crib awake. Soothe baby while keeping him in the crib (e.g. rub his back, shhhh him, or place your hand on his back). If baby absolutely cannot be soothed while in the crib, pick him up and institute a calming technique such as walking him around the room or rocking. Once he is calm, lay him back down in crib awake. Keep repeating the cycle until baby is sleeping. Stay strong and don’t give in! Giving in will just require you to start all over and lose any progress you may have made. You don’t have to do this alone. Sometimes having someone there to hold your hand through the whole process is the best option! If you don’t want to mess around, check out how you can get 24/7 access to someone who can get your baby sleeping in LESS THAN 3 weeks! Happy sleeping! A video monitor can be your best friend in this experience. You can find out so much by just observing your baby. You will be able to see what he’s doing when he’s crying which will help determine your next course of action. Are his eyelids getting heavy as he’s crying indicating that he’s falling asleep? Is he sitting up? Is he showing any signs that you need to go get him right away like throwing up? The things you need to do or consider in order to maintain the success of sleep training. If/when your baby wakes up in the middle of the night crying or fussing, you’ll need to…. If still crying/fussing after 10 minutes, go in the room and repeat the process from earlier. Once your baby has demonstrated 3-5 successful nights of falling asleep on his own, you can start working on naps. Follow the same process as bedtime. *It is imperative that you get baby down for a nap BEFORE he gets overtired. An overtired baby will NOT go down for a nap well! The key to success is consistency. Keep your promise and fully commit to the process if you want results. Do not give in and fall back into using sleep props. It will only be easier for that particular night. It won’t help you reach your overall goal. Now doesn’t it feel good to be “over it”? A routine is so important! I love your printables you can give to caregivers! Sleep training is one of the most important things you do as a parent in my opinion. Is one of the first “rules” you set and teach your child even if they’re just a baby. It’s hard work and dedication but I’m the long run is so beneficial for both baby and parents. We had it down until my daughter figured out how to climb out of the crib. Now she is a maniac and I have to figure out how to start all over with a 3 year old. Sleep is so important! I think sleep training gets a bad reputation, but it doesn’t mean just stick a baby in a dark room and walk away for 12 hours! It means you set up your child to get the best sleep they can, which is healthy. Teaching healthy habits in an appropriate manner is a good thing. This is a great resource! Thank you for sharing!! Ahhh yes! I completely agree with you on this! I always kept a schedule and I always kept the room dark, even during those middle of the night feedings. You nailed it! Thanks for this! I just started sleep training my 7 month old baby and it was going great up until the third night. He anticipated what was going to happen as soon as I started walking around the room with the lights off. So, I don’t know if this is because the room is too dark or he remembers the routine because it happened the day before. I don’t know if I should keep a night light or stick to it? Thank you in advance for any tips! Stick to it!! I doubt it’s because the room is too dark. It’s probably, like you said, just because he knows what’s coming but that’s not necessarily a bad thing. He’s just learning his new routine so consistency will be the key :). Keep me posted! You were absolutely right! He sleeps right away now, and its day 7! But he started waking up early, around 5am and some days he falls back to sleeps and other days he’s just standing in his crib 😂. Any advise? Also, i would appreciate tips on sleep training for naps! So happy to hear he falls asleep right away now! Great work mama! What time does he go to bed? I’d say if he’s just hanging out in his crib not crying then just keep him in there until the time you want him to wake up (within reason lol). If he’s crying/upset though then I’d just get him up and maybe try and wait a little bit for his first bottle. Once he’s been consistent with night time for 5-7 days, then move on to naps. I followed the same exact process for naps as I did for nighttime! Just be sure you’re really following his awake time (7 month olds- 2.5 hours between naps) so you’re hitting the naps at the right times (when he’s sleepy but not overtired). Good luck! This is so true!! I am so diligent at keeping my kid on a routine but my own routine is a disaster lol.